I rarely begin a review by drawing final thoughts right off the bat, but the SlingBox Solo simply rocks. For those that haven’t heard of SlingBox, it’s a little set-top box that streams a residential Satellite or Cable TV feed over the internet for remote viewing on a Mac, PC, or mobile device. That means being able to enjoy the TV content you receive at home from just about anywhere that has internet access. Asides from wishing for a few additional features in a future iteration, this was simply one of the few products that worked so well right out of the box that it deserves commendation. There are usually many pitfalls set-top boxes wind up in, but fortunately, SlingMedia got it all right. This is where set-top boxes usually hit the first hurdle. Customers often have no choice but to return a product when they can’t manage to get it running due to overly complicated diagrams and wordy instruction manuals. Fortunately, getting the SlingBox started took just a few minutes with a simple step-by-step process accompanied by clean visuals. The package included the bare essentials: the SlingBox Solo, a power supply, composite video cables, an Ethernet cable, and an IR dongle. The instructions walked me through wiring the SlingBox with Composite video cables from my Cable/Satellite box or DVR, draping the IR dongle over my TiVo, and wiring an Ethernet cable to my D-Link router. After powering it up, I headed over to my WiFi-enabled laptop and launched Firefox. 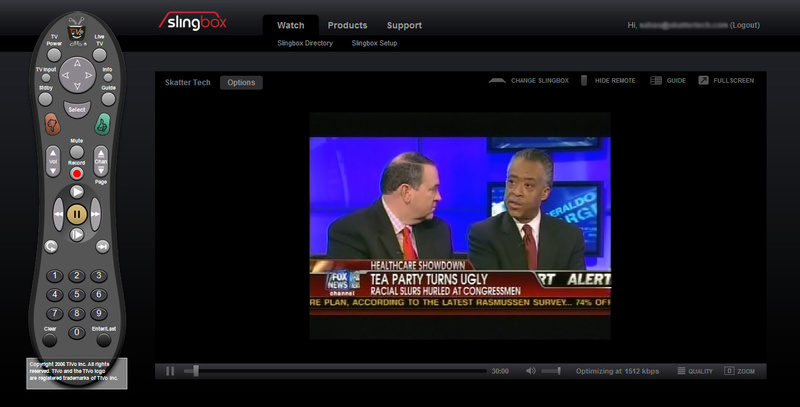 I visited SlingBox.com, created an account, and installed their required Firefox plugin. The browser soon restarted and automatically detected my SlingBox on the network. I didn’t have to forward ports or do anything remotely technical. There was a notification regarding a new firmware upgrade for the SlingBox and with one-click, it began updating. After a few minutes, I was ready to continue with the setup process. A walk-through wizard guided me through selecting the video source, picking the model of my TiVo, and keying in my ZIP code for a digital TV Listings Guide. There was even a live video preview and a virtual remote that let me switch channels during the setup process. Within just a few minutes, I was ready to go without any obstacles. If I had to suggest an improvement, the inclusion of Wi-Fi would have helped since my router was on the other end of the room. Also, despite the box advertising support for HD inputs, they didn’t include a set of Component video cables. 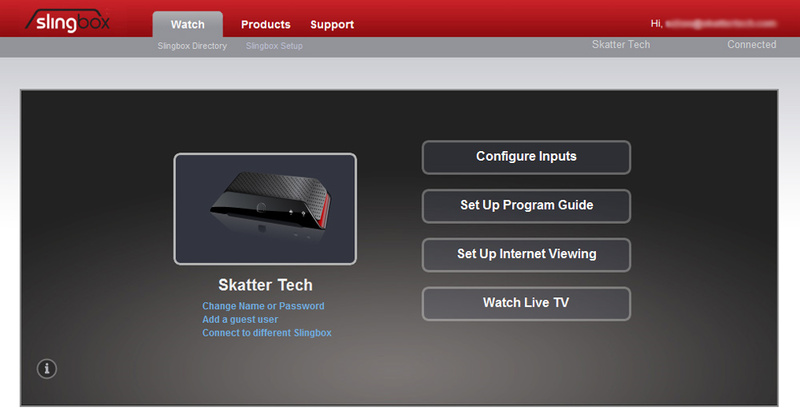 However, on the bright side, the getting the SlingBox working will be easy and quick for the average consumer. Plus, if anyone needs help, SlingMedia even offers a phone number, email address, and website for support inquiries. I spent a couple of hours streaming TV from one room to another at home on a high-speed local area network. Live content had about a 5 second delay and came in at nearly 5,000-6,000 kbps with both audio and video being crisp and clear. There were no pauses due to buffering and I never faced jitters or choppiness, which are generally common problems associated with streaming technologies. Switching channels or performing navigation commands took about 2-3 seconds on average and requires a good amount of patience if you enjoy channel surfing. Fortunately, once you lock onto a show, it’s no longer a problem. The picture quality is definitely a small step down from what you’ll see on your TV, but still quite watchable with a hint of “graininess” and “pixelation.” I was glad it worked, but I was cautiously optimistic as the true test would be streaming from a remote location. Over the next few weeks I tried tuning into my SlingBox feed located in Davis, CA from a couple of locations: from the UC Davis campus with a super fast 80 Mb/s download speed, from a friend’s place with a 12 Mb/s cable service, and from my parent’s place nearly 150 miles away with a slow 1.5 Mb/s DSL line. While download speeds are important, I should mention that getting the best quality is highly dependent on the upload speed of the broadband connection powering the base unit. SlingMedia’s servers only take care of the technical aspects of forwarding ports and getting you connected to your SlingBox, not transferring video content. Fortunately, my upload speeds are about 4-5 Mb/s on average, which is plenty for handling streaming my TV content. 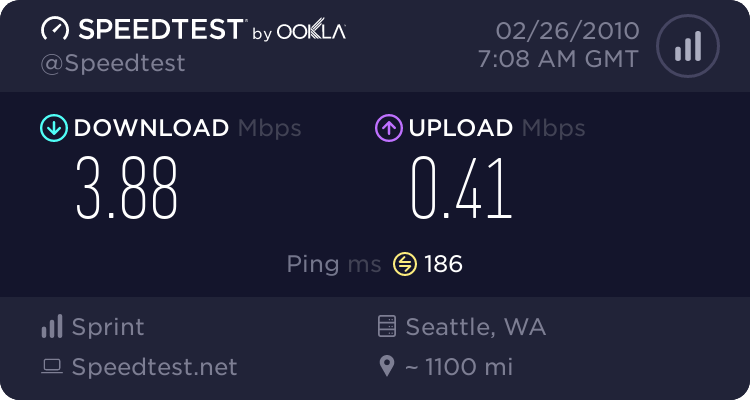 After running tests in all three locations, I was surprisingly able to receive a high quality video stream despite varied incoming speeds of 1,700 to 2,500 kbps right in my Firefox browser. As a geek, I naturally wanted to push streaming tests even further so I decided to give it a shot over Sprint’s new 4G network in Seattle, WA and on Verizon Wireless’s 3G network in the San Francisco Bay Area. After pairing Sprint’s 4G Overdrive mobile Wi-Fi hotspot with my Dell XPS Laptop, SpeedTest.net calculated my download speeds just short of 4Mb/s. The next generation of mobile broadband was more than enough to bring in my SlingBox stream at 1,500 kbps. I then took a step down using a 3G card that generally averages 2 Mb/s download speeds and it also surprisingly managed to open and maintain a steady stream at about 500 kbps. Although video quality become somewhat more pixelated, it was still decent enough to get a dose of TV when needed. On-screen text was most affected, but general video blending wasn’t at all an issue. I am quite impressed with SlingMedia’s work to create a scalable technology that literally overcomes performance issues even with the bottleneck of slow bandwidth. I was further astonished to realize that both Hulu and YouTube often had to pause to buffer while my SlingBox live stream didn’t, though the quality is a step down. I don’t know the secret behind the SlingMedia compression code, but it works like magic. Even when you are on a slow connection, both video and audio keep running strong. If you are on a PC or a Mac, you can use a desktop SlingPlayer client or enjoy your SlingBox content right from your web browser. Both are free and fully functional solutions. However if you own a BlackBerry, Windows Mobile, Palm OS (not webOS), iPhone/iPod Touch, or Symbian smartphone, you’ll have to pay a one-time $30 fee to grab the mobile SlingPlayer App. If it’s something you plan to use quite often, that’s a small price to pay considering there’s no monthly or yearly fees of any sort associated with any SlingBox service. The convenience of being able to access your TV broadcast and recorded shows from a DVR on a mobile device is quite frankly fascinating. Streaming over 3G networks was initially disabled due to contractual reasons with AT&T when I first was given access to the App. Being restricted to a WiFi hotspot was quite restricting and a major setback for SlingMedia. AT&T made it sound as though the iPhone SlingPlayer App wasn’t optimized enough for 3G streaming, but it seemed to run smoothly with my Verizon Wireless 3G MiFi. A few weeks later, SlingMedia released a minor update in coordination with Apple and AT&T that enabled 3G streaming. I found that whether I was within the city of Davis, CA or hours away, the program was quite reliable. The video and audio quality was almost always clear enough to comfortably enjoy a show. Each time you launch the App, there’s a few second delay since it assesses bandwidth speeds and optimizes the stream for the best performance. Once viewing your feed, switching channels is an easy swipe down or up. There’s a convenient favorites menu that allows bookmarking channels for quick access. A double tap brings up the DVR controls to play/pause or forward/rewind a show. There’s also a D-pad, numeric keypad, and a full menu of commands to control your TV. I wasn’t too particularly satisfied with the messy menu organization and found it to annoying to navigate. There’s also a fairly long delay after each command which requires plenty of patience. I was also disappointed to learn that there wasn’t a local digital TV Guide as found on the Mac and PC versions, but that I had to resort to using the TiVo Guide which was difficult to use on a small display. When it comes down to the bottom line, the SlingBox is an amazing device if you have times you need to get a dose of TV when away from your home. With support for both Macs, PCs, and mobile devices, it’s everywhere. The only major disappointment was when I learned that both the SlingBox Solo and Pro-HD only support streaming to a single device at a time even if they are on the same channel. However, with no monthly or yearly fees, a one-time hardware purchase makes this an amazing deal. If you have a broadband connection and a subscription to Satellite or Cable TV at home, this is a prefect solution to getting free access to live TV anywhere. While many shows are beginning to legally hit the internet through distribution mediums such as Hulu.com for streaming or iTunes for paid downloads, episodes often don’t appear for a few days after broadcast. In fact, sports fans have little to no options of when it comes to watching their favorite professional sports event live online whether it’s football, baseball, or basketball. 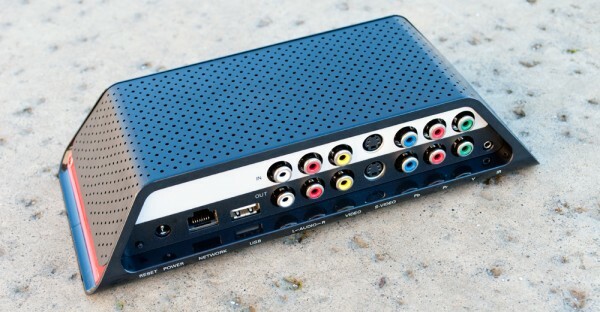 The SlingBox is a perfect solution and when it comes down to the bottom line, it’s affordable, easy to setup, and simply works. I’ve never been able to watch TV this easily from so many places. That’s really disappointing to hear about poor customer support. As I expressed in my review, it was one of the few products that worked really well. I actually updated the firmware with one click with no hiccups. Another Skatter Tech writer, Sharath Shroff, dusted off and upgraded his much older SlingBox model with the latest firmware without any issues as well. The iPhone App worked really well for me on both WiFi and 3G. I had almost no hang even when I was in car. (I wasn’t driving of course.) I didn’t have a chance to test the BlackBerry version unfortunately. What else was problematic? Speak out about some specifics and we might be able to get someone to help you out! DItto to the comment that they have the WORST customer support I have ever encountered. The system is great when it works. But if you have any problems down the road, good luck to you. I have had 2 Sling Pro boxes for a couple of years. I’m having trouble connecting to one of them. I have spent 3 hours over 2 days talking to technical support and to the phone store folks. Since my product is beyond warranty, I have to pay for support. I’m okay with that. But Tech support was unable to process the credit card payment (4 tries, and the credit card company sees zero attempts). The tech support person flatly refused to connect me to a supervisor. The store folks told me for 1 1/2 of calls that they cannot accept payment for per incident. They finally connected me to a supervisor who said processing of payment was pending, and it would take 72 HOURS! to send me an email, and then I could call tech support again. So THREE DAYS later, I can try again. I’m going out of town tomorrow (yes, this is why I wanted my slingbox to work), so I cannot deal with the issue remotely. So, when I return in 10 days, maybe they can help. All this delay for a $29.99 charge. You’d think we were handling high finance here. Product is a great idea. But unless their technical support improves significantly, consider you investment in the box as a great situation until you have an issue. Then you’ll just be SOL. 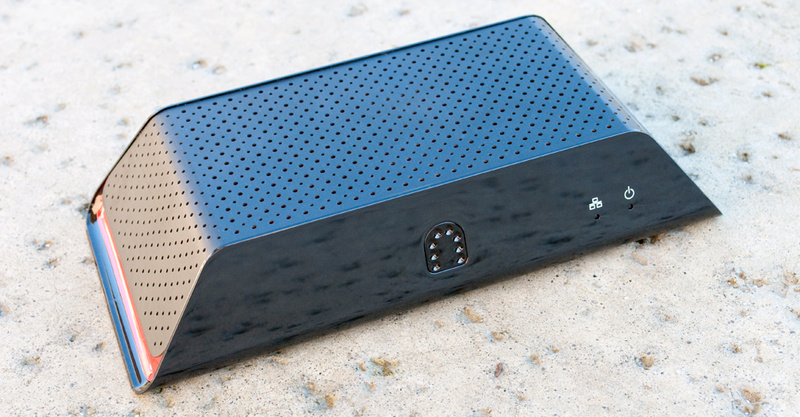 I have been a long time sling customer – the solo is my second slingbox. I have been using it running the slingplayer 1.0.10.272 on my mac running snow leopard and a windows machine. The slingbox is a SOLO running firmware 1.3.70. It typically starts/connects and the freezes when the message says optimizing. The same basic behavior happens when I connect from my mac, windows machine, blackberry app (another 30 bucks) or attempt to connect from the website this is why i think it is the slingbox is the source of the issue. In each case no problem finding it and connecting but after a few seconds (generally under a minute) it freezes. 1 option could be a hardware problem but the seems odd that it started as soon as I upgraded the firmware. Regardless, the fact that sling refuses any technical support without paying 30 dollars is crazy atleast diagnostic help would be appreciated since they seemed to create the problem. If you can get any attention I would appreciate it – I miss my slingbox. Sorry to hear that you’re having trouble with your Slingbox. I’m part of the Sling Media Support team and wanted to see what we might be able to do get your Slingbox working again. Can you go to this page (http://support.slingbox.com/go/contact-sling-media) and use the Email Sling Support link to send us an email? Include ‘Skattertech’ in the subject line so we know it’s you, and I’ll contact you directly. I have had the same issue as Ed, and cannot use the slingbox anymore. It doesn’t matter if it is the Iphone app or my netbook, at just under one minute it freezes on “optimizing”. I would appreciate any suggestions you have to solve this problem. I had hope to use my Solo while out of the states, but it doesn’t look like that is going to happen. Hey Fiver, I would do the same thing Ed was told to do. Go email Sling Support though the link above your comment. They might help you too! I’ve been having the same problem since a week or so after my iPhone app was upgraded so I could sling on 3G network. App had worked beautifully on my 3-year-old AV for that short period, then started this hanging/optimizing nonsense and veerrrry slooooow streaming on the phone and every PC I tried it on. (Everything else on the network’s fine and I’ve seen no problem with other streaming video.) First tried replacing power supply (apparently a known issue), but when that didn’t work, sprung for a new Solo. Arrived this week and it’s doing exactly the same thing. And apparently the same thing’s happening to a lot of other people posting on Slingmedia’s own forums and still there’s been no response. What’s more, the link to e-mail is there but doesn’t work. This is definitely not the customer-friendly company I dealt with when I bought my first Slingbox in December 2007, or the one whose products I recommended to so many people. You’ll need to use Apple’s official cable. They switch the video cable with one of the two audio cables. Try messing around with plugging the outputs from your iPhone into the TV in different combination. purchased official apple iphone av cable, played with inputs still no video outputs to tv, works great for movies off iphone but not slingplayer. any help gratefully appreciated. Interesting, Apple may have placed restrictions on the App to specifically not allow that feature. When will they bring out an iPad version of the software. I’ve been a fan from day one and have the slingcatcher as well as iphone software. They need an iPad update to drive adoption I think. Ok, here’s how I fixed my SOLO which froze up 30 seconds after connecting. I followed this and it worked like a champ!! My Slingbox used to work great-now on Brighthouse cable with a HD TV I get audio but no video when I try to watch. My iPhone only gets to the “optimizing” stage……..I have spent $60 in tech fees & still don’t have anything that works.